We want to spotlight one of our favorite products here at Medlin Ramps: The Order Picker Platform. Why? We love the flexibility, safety and efficiency of this unstoppable piece-picking machine, and we are all about making sure that you, our loyal customers, have all the information you need to make the right decisions about your equipment purchases. Maybe you work in a warehouse with a layout that has pretty narrow aisle racking, or you have a stockyard where you are loading and unloading different styles and sizes of trucks, and your product won't always fit neatly on a pallet. Whatever your situation, an order picker platform turns your current forklift into a multi-product lift truck that isn't compromised by large or odd-shaped objects. Need to move small parts, too? This piece of machinery can handle it. All you have to do is drive your forks into the pockets of this beauty, secure the pallet clamp and off you go. No logistic problem is too tough with a Medlin order picker platform! Like you, we believe that worker safety should be the paramount concern on any job site. It is everyone's job to maintain a safe working environment – from the workers on the ground to the managers – and we believe that includes the manufacturers of equipment, as well! We want to team up with you to make sure everyone is whole, healthy and happy at the end of each work day, so all of our order picker platforms are built to the most exacting safety standards. You can be sure you will meet OSHA's requirements, because we have maintained or exceeded those standards for over twenty years on everything we build. With safety in mind, we build our order picker platforms with several standard features, including fixed and removable end rails, casters and a solid smooth plate floor that provides superior worker stability. We also ensure that all of our equipment is highly visible and has tight maneuvering to avoid potential work floor accidents. Of course, after safety, you have to worry about the profitability of your company. Medlin has your back here, too. 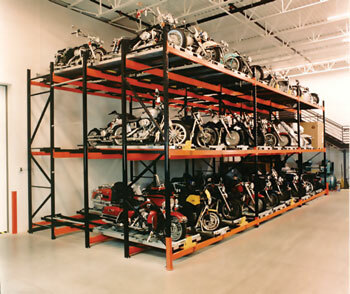 We build all of our order picker platforms from the highest quality heavy duty tubular steel to ensure that you will not only maximize the return on your investment, but have the peace of mind that comes along with knowing you own a product built with longevity and durability in mind. No matter how tough your operation, or how extreme the environment you are working in, you can count on the quality and craftsmanship of a Medlin order picker platform. We're so sure of our work that we provide an industry-leading warranty. If you want to simplify your piece-picking operations while maintaining a consistent focus on safety, profitability and efficiency, Medlin is the right company for you. Check out our custom sizes and designs of order picker platforms today, or contact us if you have any questions or concerns. We're always ready to support you! What Is A Pallet Rack?